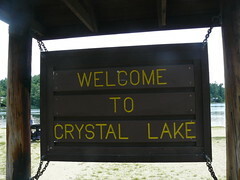 Crystal Lake is a neighborhood in the southeast corner of Manchester. Crystal Lake is east of the Lower South Willow/Airport Neighborhood and south of Green Acres. Crystal Lake is bordered by Interstate 293 to the north, Interstate 93 to the east, the Londonderry town line to the south, and S. Mammoth Rd. to the west. This neighborhood takes its name from a natural pond near Bodwell and Corning Roads. Known historically as Skenker’s Pond and later Mosquito Pond, Crystal Lake has long been a place for residents to enjoy swimming, fishing, and boating. It was also home to Charles Alan Lambert, otherwise known as the “Hermit of Mosquito Pond”, who came to Manchester in the 1840’s and chose to live a life of solitude on 40 acres of land he purchased in this neighborhood. To learn more about Crystal Lake, and its restoration success story, please visit the City of Manchester's Environmental-Protection Supplemental Environmental Projects Urban Pond Restoration Program.